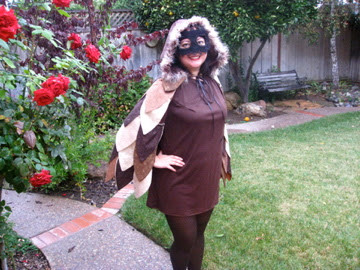 The owl costume is finally complete and was ready for the weekend festivities! Here are some pictures of the final costume. I'm thinking about adding a belt, I just haven't found one that's called out to me yet. You can read more about the 'made' costume pieces by clicking on the links to the corresponding items above. They are previous blog entries. 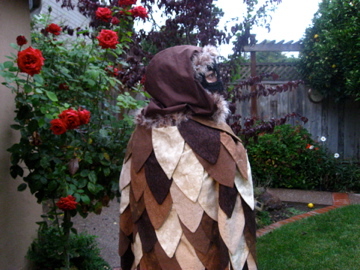 The back of the feather cape. I also wanted to be able to wear the dress after Halloween, so I paired it up with a cardigan and picked up a vintage sweater guard. Through the powers of the internet, this was super easy to do. A great place to look is etsy; I used the Designs by Annette shop. So, whooo (or what) are you going to be for Halloween? I'm going to be HitGirl for Halloween, I finished my belt over the weekend and got the approval of my friends. I can't wait to party this weekend. That's fantastic! The owl cape is amazing. I hope you have a lovely Halloween. Ooh, that's much cuter than the pattern photo. Too bad I have to make it exactly :( Now I'm worried about not having enough feathers, thanks a lot! Lol.